Computer History Museum site with details on the history of computing - large reference collection on-line and library references. Virtual Museum of Computing - site with web links to a large number of international sites with details on computer history. IBM history - extensive site on history of IBM including early Hollerith machines and later products under IBM. The Australian Science and Technology Heritage Centre - provides on-line resources including Technology in Australia 1788-1988, Chapter 8 looks at development of computing in Australia. The Australian Computer Museum Society - preserves the history of computing in Australia. CSIRAC - a detailed history on the early computer CSIRAC, built in Australia in the 1940s. Computing in Melbourne: A Historical Tour - the web site describes a self guided six (6) hour tour around Melbourne and directs the tourist to points of interest in the history of computing in the great southern capital. Rood, S. 2008 (in prep) From Ferranti to Faculty: Information Technology at Monash University, 1960 to 1990 . Monash University ePress. Pearcey, T. 1988 The History of Australian Computing. Chisholm Institute of Technology, Caulfield. Greig, J. and Levin. P. 1989 Computing at Chisholm. The First Twenty-Five Years 1965-1989. Chisholm Institute of Technology, Caulfield. McCann, D. & Thorne, P. 2000 The Last of the First. CSIRAC: Australia's First Computer. University of Melbourne. Ainsworth, B., Clarke, N., Avram, C. Sheard, J. 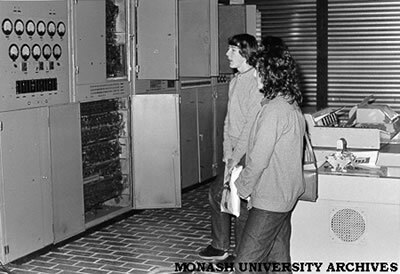 2016, MONET – Monash University’s campus LAN in the 1980s. A bridge to better networking. Proceedings of the IFIP WG 9.7 International Conference, International Communities of Invention and Innovation, HC 2016 New York University, May 2016, New York NY, USA. Museum of Applied Arts and Sciences, Sydney, Australia. National Museum of Australia, Canberra, Australia. 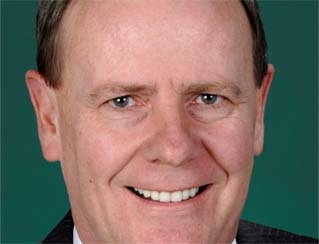 This site is a good reference to find Australian museums. MONPIX - Online Image Database. Australia’s first computer CSIRAC on display at Monash Univesity Caulfield campus in 1980 (then part of Caulfield Institute of Technology). CSIRAC was on display from 1980-1990 (as seen on the right) before its return to Museum Victoria. Image source: Monash University Archives Monpix 3220.